Ford has just revealed the 3.5-liter V6 EcoBoost-powered Explorer Sport, the American carmaker's first-ever high-powered version of the nameplate. It's also the third version in the Explorer's current lineup following the 3.5-liter V6 and the 2.0-liter EcoBoost-powered variants. With a twin-turbocharged EcoBoost V6 engine producing over 350hp and its four-wheel drive with terrain management system, Ford claims that the Explorer Sport delivers enhanced on-road dynamics with sporty design cues inside and out. Despite its power output, the Explorer Sport has a projected fuel economy of 6.802km/L in the city and 9.353km/L on the highway, bettering the fuel consumption of the 5.7-liter V8 Hemi-powered Jeep Grand Cherokee and Dodge Durango by 1.275km/L in city and 0.850 km/L on the highway, respectively. It's also more fuel efficient than the 5.0-liter V8 Range Rover Sport by 1.275km/L in the city and 1.701km/L on the highway. Putting all that power down to the wheels is a paddle-shift six-speed SelectShift automatic transmission that, Ford claims, provides "the balance of responsive acceleration and economical low-rpm cruising for better fuel efficiency." "Adding an EcoBoost drivetrain to Explorer Sport delivers even more fuel efficiency and performance to the lineup," said Bill Gubing, the Explorer's chief engineer. 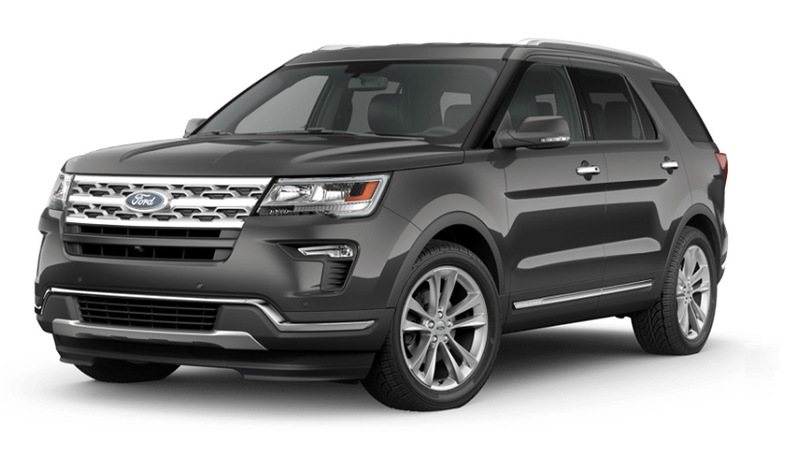 "This is our highest- performance, most capable Ford Explorer ever." Making the Explorer Sport stand out from its more plebian brethrens are its low-gloss Sterling Gray mesh grille and its contrasting ebony high-gloss bars, a black front lower fascia that features a functional opening for additional cooling, unique 20-inch painted and machined wheels, blacked-out headlamp and taillamp treatments, black roof rack rails, sideview mirror skull caps and a liftgate appliqué. The posh feel continues inside with the Charcoal Black leather-trimmed seating that's available with and without contrasting Sienna inserts, unique stitching to the sculptured seats and steering wheel, Sport-logo floor mats and illuminated scuff plates. The Ford Explorer Sport officially goes on sale later this year.